Some of us at ACT UP work together as the Knowledge Base. We are interested in researching and analysing as much as we can about the HIV epidemic in Ireland and finding ways to share that information with a wider public. This post is the first in an occasional series called “ACT UP is watching” where we respond to incomplete or misleading statements about Ireland’s HIV crisis. Last year, Ireland’s Health Protection Surveillance Centre (HPSC) recorded 485 new HIV diagnoses—the highest number ever in the history of the epidemic in this country. Of particular concern, new diagnoses among gay and bisexual men have increased dramatically over the past decade, more than quadrupling since 2005. ACT UP Dublin believes that these figures underscore the compelling need for a more effective response from government and community organisations. In recent news reports, some stakeholders have tried to minimise the urgency of these figures. They’ve suggested, for example, that if we exclude people who were previously diagnosed outside of Ireland, the numbers of first-time diagnoses are consistent with years past. Some also suggest that the increase in diagnoses may be attributable to increased rates of HIV testing, implying that the rising numbers reflect a public health success story rather than an inadequate and ineffective response. In this post, we examine these claims in light of the available data. • Are first-time HIV diagnoses within Ireland increasing? 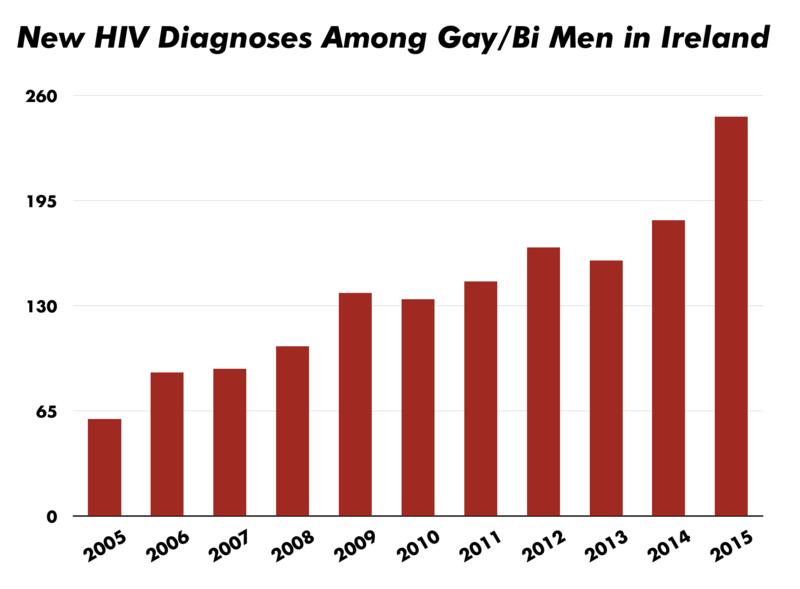 The number of “new HIV diagnoses” in Ireland for 2015 includes, as it has in previous years, people who were previously diagnosed in another country but who moved to Ireland during the reported year. In 2015 the HPSC changed the way HIV diagnoses are reported which led to an increase in the number of people who were previously diagnosed abroad, including gay and bisexual men. This accounts for some of the magnitude of the overall increase in 2015. It also indicates that figures from previous years undercounted the actual number of people who were first diagnosed abroad but who now live in Ireland. 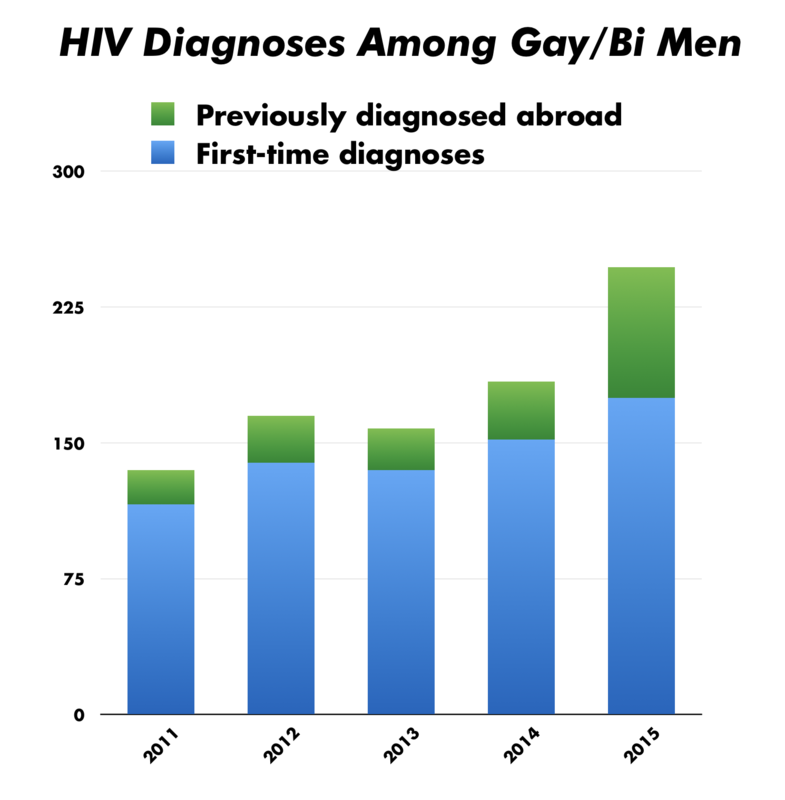 Since we know the number of gay and bisexual men reported as previously diagnosed abroad for the past 5 years, we can directly compare the number of first-time diagnoses over that time. That is, we can subtract the number of men previously diagnosed abroad from the total number of reported diagnoses, leaving just the first-time diagnoses. These adjusted numbers (the blue section of the bars in the graph) show an average yearly increase of about 12% in first-time diagnoses among gay and bisexual men through those years. From 2013 to 2014 the increase was 13% and from 2014 to 2015 it was 15%. Overall there has been a 50% increase in new diagnoses from 2011 to 2015. It’s true that the total number of new diagnoses in 2015 is made larger because of an increase in the number of people who were previously diagnosed abroad. However the overall trend among gay and bisexual men is quite similar regardless of whether you include or exclude those previously diagnosed abroad, and it is clearly rising. Certainly the increase seems to be sufficiently worrying for health authorities to have established a multisectoral response group earlier this year that is intended to improve the state’s response to this rise in new HIV (as well as other STI) diagnoses among gay and bisexual men. Although we are pleased to know that there is an effort to increase communication and coordination among existing agencies, it is not clear how effective this new group—operating without additional funding, meeting behind closed doors away from public view, with uncertain terms of reference—will be on its own. In short: even accounting for those previously diagnosed elsewhere, it is clear that there has been a real and significant increase in HIV diagnoses among gay and bisexual men over the last several years. • Are new diagnoses due to recent increases in HIV testing? STI/GUM services, especially those specifically serving the gay and bisexual men and trans people, have been operating at capacity for years. Until very recently, there has been no significant increase in capacity for HIV testing. In 2016, new testing opportunities have been created through the Know Now rapid testing project and through the addition of a Monday afternoon clinic at Dublin’s Gay Men’s Health Service. These are welcome developments and long overdue, but the 2015 diagnosis numbers cannot reflect these testing opportunities which did not exist yet. We know of no basis for claiming that gay and bisexual men were testing in greater numbers or more frequently before this year. The MISI 2015 online survey was the first attempt to assess sexual health knowledge and behaviour among gay and bisexual men in Ireland since 2010 and it provides some estimates for how often and how recently gay and bisexual men have tested for HIV and other STIs. However, because of the way the survey was conducted, the MISI data cannot be reliably compared to previous surveys, and therefore cannot tell us anything meaningful about changes in testing rates over time. Furthermore, while men from Latin America now account for as many new HIV diagnoses as men born in Ireland, only 1% of respondents to the MISI 2015 survey were from Latin America, meaning we have almost no idea about testing rates of one of the most affected groups in our community today. Some in the LGBT community have been expressing concern about increases in new diagnoses for years now. In 2010 it was reported in that there was a ‘startling rise’ in new diagnoses, a ‘dramatic increase’ of 13% from 2009. Despite the ongoing concern at the steady increase since then, we have not seen a corresponding increase in available services until this year. The bottom line is that there is no evidence to support the claim that the increase in HIV diagnoses is due to a corresponding increase in testing rates among gay and bisexual men. • What do we know about the epidemiology of HIV in Ireland today? No one knows what the HIV incidence and prevalence rates are in Ireland. Incidence refers to how many people contract a disease each year, prevalence refers to how many people are living with that disease at a given time. Ireland lacks these basic epidemiological data because the surveillance necessary to calculate them is not carried out. It is inappropriate and misleading to refer to ‘prevalence’ and ‘incidence’ in Ireland because we don’t have the necessary information to do so. Instead, we can talk only about ‘new diagnoses’ and must speculate as to what those diagnoses might mean about the actual rate of new transmissions. Because the data available in Ireland is so limited, it is simply not possible to make accurate claims about things like the relationship between testing rates and new infections. While we lack any reliable estimates of incidence or prevalence in Ireland, we do have some basis to be concerned. A measure that is sometimes used as a proxy for trends in HIV transmission rates is diagnoses of early infectious syphilis, which correlates to a relatively recent transmission. Syphilis is itself associated with an elevated risk of acquiring HIV, but diagnosis rates may also provide an indication about current rates of those sexual activities and circumstances which are associated with HIV transmission. Syphilis diagnoses among gay and bisexual men in Ireland increased 50% between 2014 and 2015. This suggests that the number of recent transmissions of HIV may not yet be reflected in diagnosis rates, although, again, we lack sufficient surveillance information to know that for certain. 1. Commit appropriate resources to increase the availability of HIV and STI testing. • Government must commit to permanently funding the Know Now rapid testing project. The project should remain a community-organised and managed resource. • Government should increase resources for the GMHS and other STI/GUM clinics, both in Dublin and elsewhere in Ireland. 2. 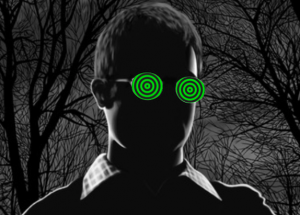 Enable increased epidemiological surveillance. Government should provide the necessary funding to enable HSPC to conduct the epidemiological surveillance and behavioural research necessary for us to have an accurate picture of the epidemic. Good surveillance should be linked to tailored prevention efforts that respond to the specific nature of the epidemic in Ireland. 3. Approve pre-exposure prophylaxis (PrEP) for those who need it. Government should make PrEP accessible to anyone at significant risk of acquiring HIV. Ability to pay should not be a barrier to access for this crucial HIV prevention resource. In September of this year the Department of Health announced a public consultation as part of the development of a new national drugs strategy. In our submission we urged the Department of Health to commit to policies based on harm reduction principles and focused on the welfare, health, and human rights of people who use drugs. We noted the many harms that punitive, prohibition-based approaches to drugs have caused and strongly opposed continuing the counterproductive application of the criminal law to what is, fundamentally a social and health issue. If you would like to read our submission to the public consultation in full you can download a pdf here.